Tiger Floor Markings are available in lengths of 1000 x 50 mm. Colours available are Green/White, Black/Yellow, Plain Yellow,Red/White There are 50 strips in a pack Price is €6.80 each strip plus vat (if applicable) Carriage is extra at cost. Tiger Floor markings are the most durable form of Floor marking available on the market. They are made from 325 micron Polycarbonate ,reverse printed for protection, with high performance 3m 468 adhesive to hold them down. 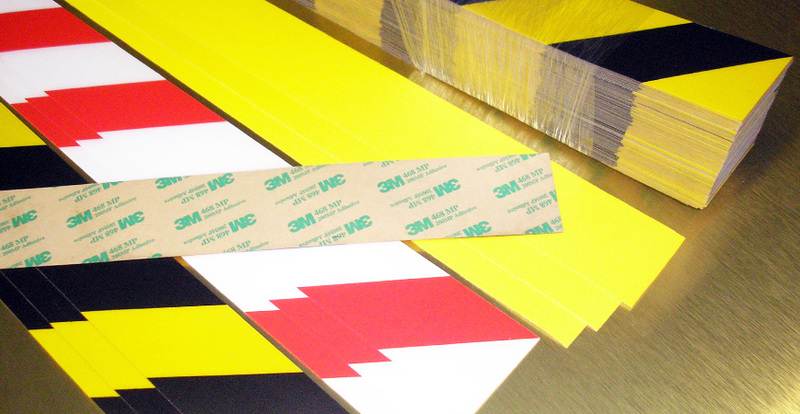 They are designed for heavy duty use and will not scratch or scrape unlike soft pvc tape. Tiger floor markings are used by Intel in their clean rooms. If you contact us we would be pleased to forward you a sample. We Accept Credit card payment and are pleased to ship worldwide. This Product is only available from Alpha signs. Also available Rolls of economy. Floor marking in 10 meter x 50 mm rolls for light industrial use made from flexible printed pvc It comes with a permanent acrylic adhesive and is available in green/white, red/white, black/yellow and plain yellow. To deliniate areas on a warehouse floor we also manufacture barcoded labels from the same materials for use on floors aswell.